A quick update today.The first of the Kickstarter projects I’m involved with will be going live on Monday, Jan 28th! It’s a puzzle book and a novel, or as the book’s author, Mike Selinker, puts it a “solve your own adventure” book. And it’s called The Maze of Games. Here’s links to Preview #1 about the book and Preview #2 about the creative team. Occasionally I create a piece for Magic that practically vanishes. Sometimes the piece is put into the graveyard. This is a repository for art that no longer has a home due to its card either radically changing – and requiring new art – or the card being scrapped entirely. I have one piece that may never see the light of day as it was a very setting-specific creature for Kamigawa and Magic may never return to Kamigawa as it wasn’t a popular block. The other occasion when a Magic piece doesn’t reach its broadest audience is when it’s an image for a token, especially when it’s a token made solely for the digital version of the game. This entry is about the latter. I was assigned the horror token card for the Ravnica set. The card that actually generated the horror tokens was painted by someone else and it didn’t actually show any horrors so I was free to design my own creature. 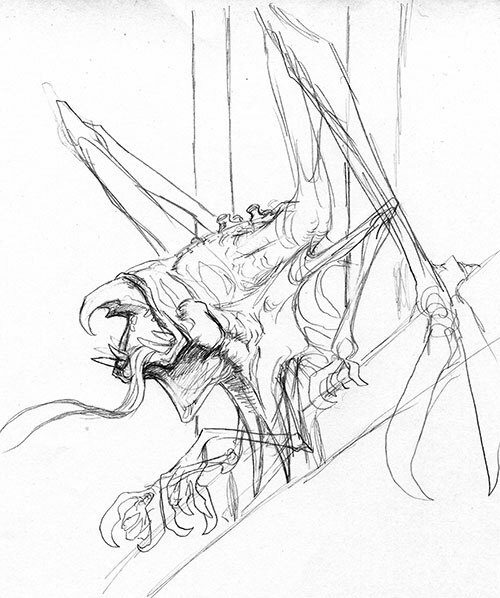 The art description amounted to not much more than “It’s a horror and it lives in Ravnica”. So given that, I went for a disturbing, distorted creature, y’know, like you do. I wanted to creep myself out if I could. And I painted it in an unsettling mix of reds and purples that while suggestive of those few minutes right after sunset actually have more in common with the colors of raw meat. Now with 80% more tendrils! 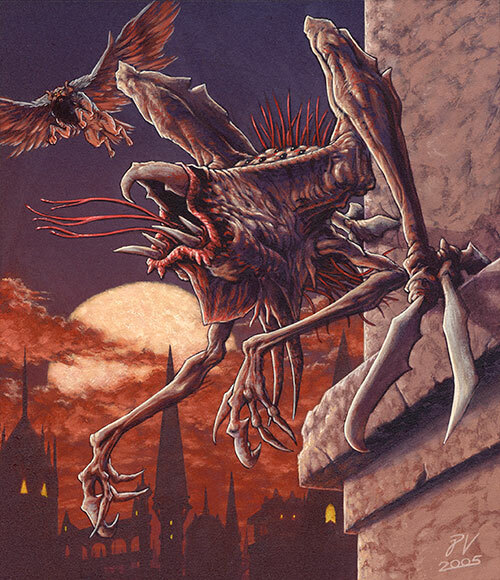 The creature flying overhead is a callback to the card that generated the horror tokens in-game. And, yes, I sleep just fine at night, thanks. From 1985 to 1997 London was home to the United Kingdom Comic Art Convention. The UK didn’t have many comic cons and this one, while far smaller than many American shows, was eagerly anticipated every year by UK comic fans as an unprecedented opportunity to talk to the major comic companies and to rub shoulders with British and American creators, though in the case of the creators, you usually had to track them down in the on-site bar. No, really. Like most comic cons, there was an accompanying con-booklet bursting with new images from fresh and established talent. One year I decided to give it a try because I’d gotten a mad idea that didn’t want to shut up and leave my brain. Tidbit #1; By now you’ve probably heard of Neil Gaiman. At that time, he was mostly known for his comic book Sandman which features Dream, the personification and master of dreams and his six siblings collectively known as The Endless. 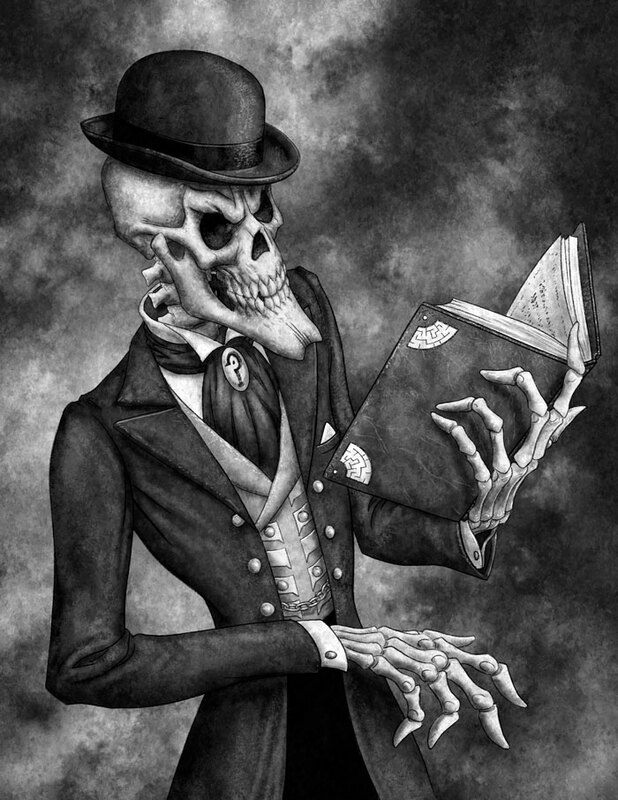 The most popular and enduring of these personifications is Death, who appears as a cute gothy girl with an unusually sunny disposition given her rather harsh vocation. Tidbit #2; 2000AD has been the most popular comic in the UK for decades. And no character is more popular than Judge Dredd, the toughest cop in the harsh Mega-City of the future. From a rich rogues gallery that’s been developed over 34 years, no enemy deserves the rank of nemesis more than Judge Death, a member of the Dark Judges, a dark mirror to Dredd from a dimension where it was decreed that all crime was committed by the living and so their perverse logic made life a crime. From the Vault: Revenge of the Lhurgoyf! Like most anyone with an internet presence I will occasionally search my own name to see what comes up. Tucked in between the pages (and pages!) of card lists there’s the occasional mention in a forum (and it’s 50/50 on whether the mention is complimentary) and once in a blue moon I find something really surprising. This would be one of those latter occasions because I found a picture I know is my handiwork, but have no recollection of ever painting. The shock was sufficient that when I first saw it my immediate reaction was “WTF?” rather than “oh hey, haven’t seen that in forever”. 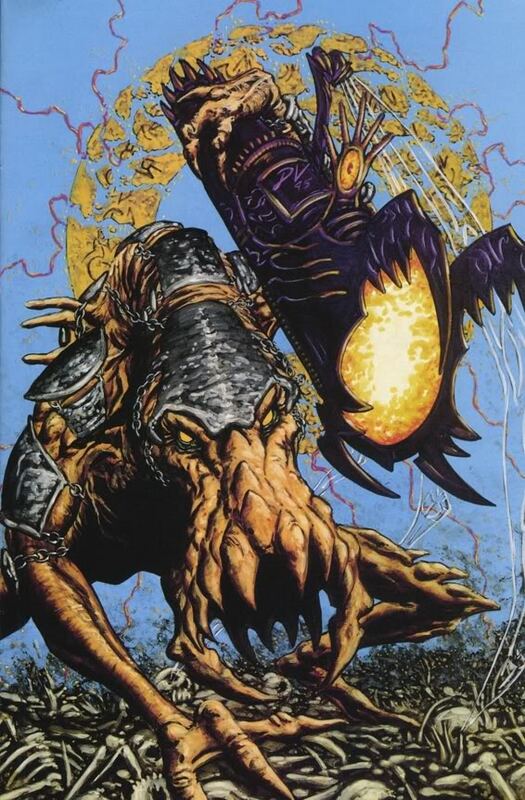 That’s the Lhurgoyf, carrying a Rocket Launcher (from Antiquities) which seems to be powered by the Souls of the Damned (Ice Age) while rampaging across a fields of skulls from Spoils of War (also Ice Age). There also appears to be a Nevinyrral’s Disk in the background, and ole Lhurgy is wearing armor, but I have no idea which card that’s referencing. Maybe WTF was the correct response after all. Yeah, I got nothing. I suspect the image was painted for a Duelist article and I guess it was painted during a VERY busy time which is why I don’t remember it. Possibly as long ago as 1995. Gotta tell you it’s a weird feeling being (re)introduced to one of your own paintings. I wonder where the original painting is? If it’s in my studio, it’s really well hidden.